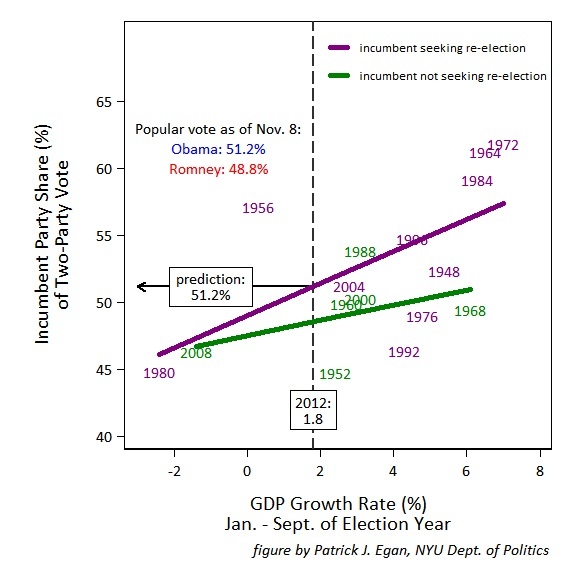 The following is a guest post from NYU political scientist Patrick Egan on a topic near and dear to the Monkey Cage, the fact that the economic fundamentals (defined here as GDP growth) of the election suggested the likelihood of a victory in 2012 for the incumbent – albeit a fairly narrow one – and not the challenger. If you think the “fundamentals” (and by the “fundamentals,” I mean the economy) were stacked in Mitt Romney’s favor in the 2012 presidential election, you’re not alone. You share the prevailing beliefs of many political observers. “Fundamentals usually prevail in American elections. That’s bad news for Barack Obama,” wrote the American Enterprise Institute’s Michael Barone in a National Review post on November 5. Barone was referring to what he called the “very sluggish economic recovery”—dissatisfaction with which he predicted would cause challenger Mitt Romney to prevail with 315 Electoral College votes. Barone’s analysis sums up much of the conventional wisdom about the results of the 2012 presidential election that has crystallized among pundits across the political spectrum. Most versions of their explanations go something like this: the fundamentals were in the Republicans’ favor, but the Democrats overcame them with better ads, a better “ground game,” successful appeals to a racially diverse electorate, or a better candidate. The growth rate between January and September of 2012 averaged 1.8 percent. As shown in the figure, this yielded a predicted share of 51.2 percent of the two-party vote for incumbent Obama. How well did this forecast the actual outcome? Right now (as of noon on November 8th) the popular vote totals stand at 60,771,081 for Obama and 57,876,223 for Romney—exactly 51.2 percent for the incumbent. The results stand exactly—one might even say fundamentally—where the fundamentals would predict. Great analysis! It’s too bad the punditry will conclude the President won in spite of the economy. First time reader, love the blog! Please provide a confidence interval. Looking at the scatter it looks like the prediction would be very noisy. The fact that the predicted conditional mean in repeated sampling is exactly the same as the actual can lead to hubris. I think you are interpreting your chart incorrectly. What I think the chart actually shows is that what matters most is the answer to the simple question, “Is there an incumbent in the race”? If there is an incumbent the incumbent wins; if there is no incumbent the party out of power wins. This single question correctly predicts the winner in 14 of the last 18 presidential elections (i..e from 1936 to now). I think this is partly because the incumbent controls the agenda to such a degree (see how Obama handled Sandy), and partly because a non-incumbent (of the same party) shares the blame for anything the incumbent did badly, but doesn’t get the credit the incumbent gets for simply having been presidential for 4 years. Michael: I can report that the effect of GDP persist even when you control for incumbency. What Pat’s chart shows is that the effect of GDP is stronger when an incumbent is in the race. And you also have to ask: why do so many incumbents win? Part of the answer is how the economy is doing in their reelection year. I think you are stating it backward. How the economy is doing in their reelection year is part of the agenda that incumbents have (at least) some control over. Incumbents win in (large) part because they control the agenda, and part of that is controlling the economic flow so that it does “better” in their reelection year. My point is that for whatever reason, it is sufficient to know if the incumbent is running to predict the winner. 14 (or more) out of 18 occurs by chance only about 1.5% of the time. Thus absent some catastrophe in the next 4 years, the “incumbent question” alone says the Democrats will be underdogs in the 2016 election, which is certainly different from current conventional wisdom. In the interest of bringing voting behavior and public-opinion research together: given findings of public ignorance, what is the mechanism is supposed to be that informs voters of precise GDP figures? These are not widely reported, and GDP is a construct that personally affects different people in radically different ways (if at all). With so many outliers, one wonders whether less precisely measurable variables (such as media coverage of the economy rather than actual statistics) would do a better job of explaining the scatterplot–or whether the economy simply doesn’t play as great a role in some elections as in others. Perhaps it is not the GDP figures that drive voting behavior, but the underlying economic realities the GDP figures represent. No mechanism is necessary to inform voters of their own economic well-being. If this is the case, the outliers could result from the limits of the BLS metrics to represent the state of the economy at a given point, rather than a disconnect between overall economic health and voter behavior. My prediction would be that as the methods the BLS employs become more sophisticated and powerful, we will see fewer outliers, and those that we do see will result from events like the third-party candidacy of Ross Perot in 1992, which are difficult to model. I’m just not buying this It’s the Economy Stupid. I don’t think it was. I think that poor economic performance is increasingly surmountable for the Dems given the polarized, cultural, demographic firewall they benefit from over the GOP. It seemed that Obama’s job approval was unusually insensitive to the economic fundamentals compared to most presidents over the course of their term. Also, he was favored to win compared to the any republican challenger well before Sept.